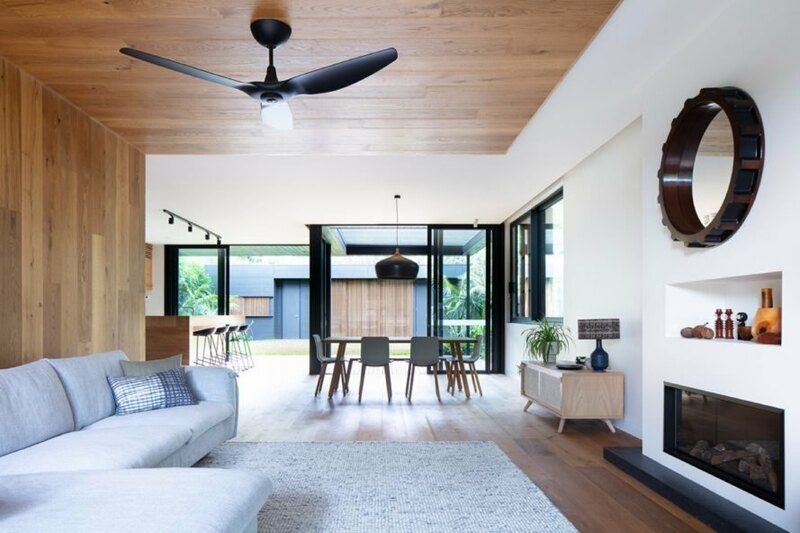 Constructed in a Melbourne factory in just 12 weeks, this elegant, prefab home in Sydney offers indoor-outdoor living without compromising thermal comfort. 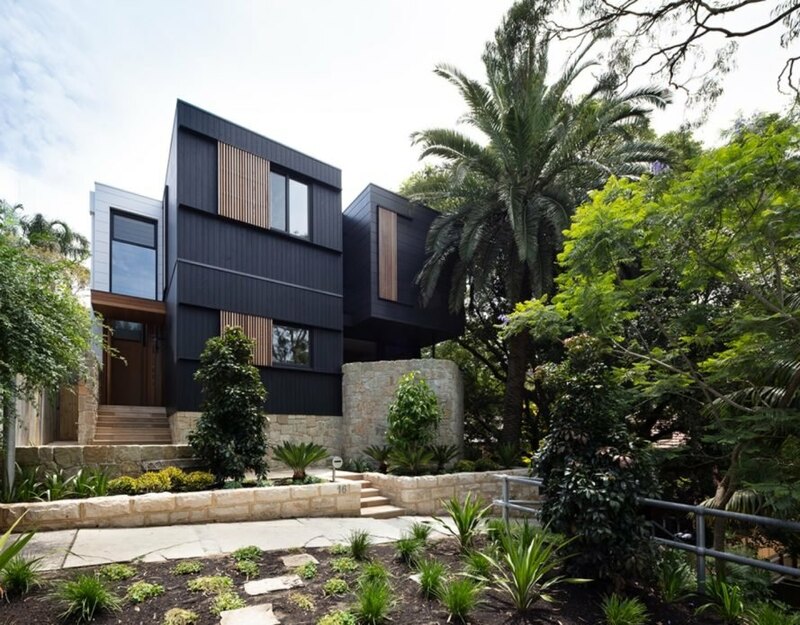 First designed by Sydney-based architectural practice Fox Johnston, the home’s concept was later refined by Australian design/build firm Modscape while honoring the architect’s design intent and the client’s demands. The prefabricated, two-story family home taps into solar design principles to prevent solar heat gain and to ensure comfortable indoor temperatures year-round. 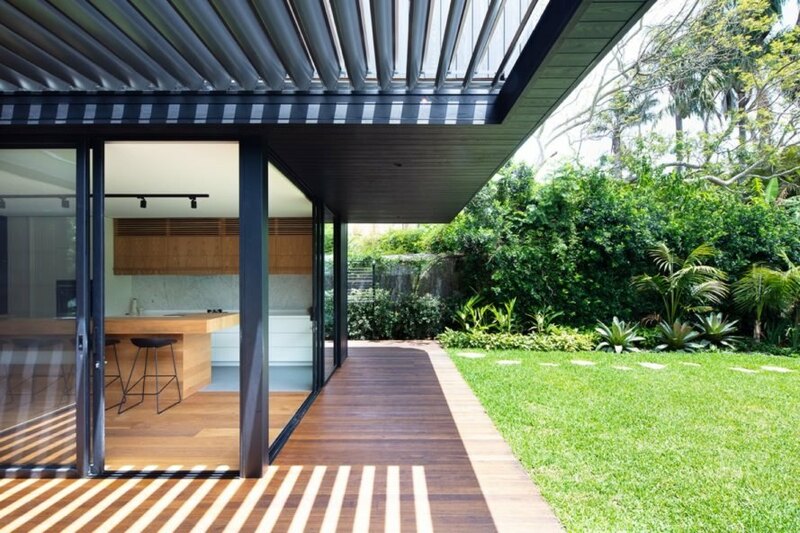 Spanning an area of 340 square meters, the modern, prefabricated home was commissioned by clients who needed extra space for their growing family and wanted to take better advantage of the property’s proximity to the beach in Tamarama, NSW. 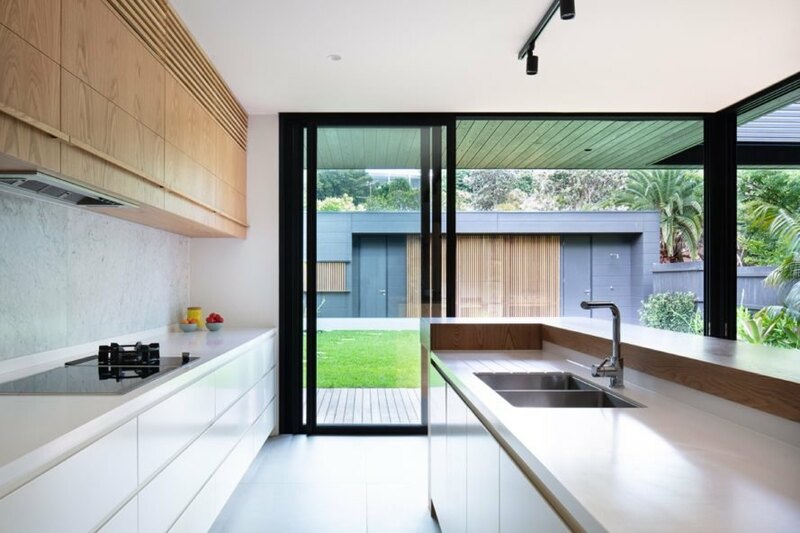 Taking cues from the original dwelling, the architects designed the new home with a similar footprint but added large expanses of glass to strengthen the building’s connections with the front and rear gardens. The existing sandstone plinth has also been integrated into the house to anchor it to the landscape. The material palette echoes the environment with its abundance of timber, which can be seen from the movable timber battened screens on the exterior to the light wood surfaces woven throughout the interior. The living spaces are located on the ground floor while the upstairs sleeping quarters consist of five bedrooms and two bathrooms. 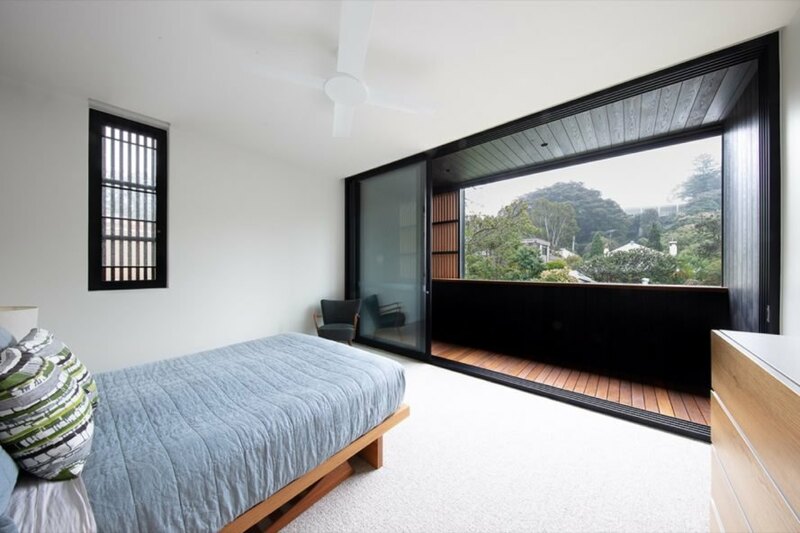 To mitigate Sydney’s harsh summers, the home is punctuated with numerous windows and skylights that maximize light and cross ventilation. 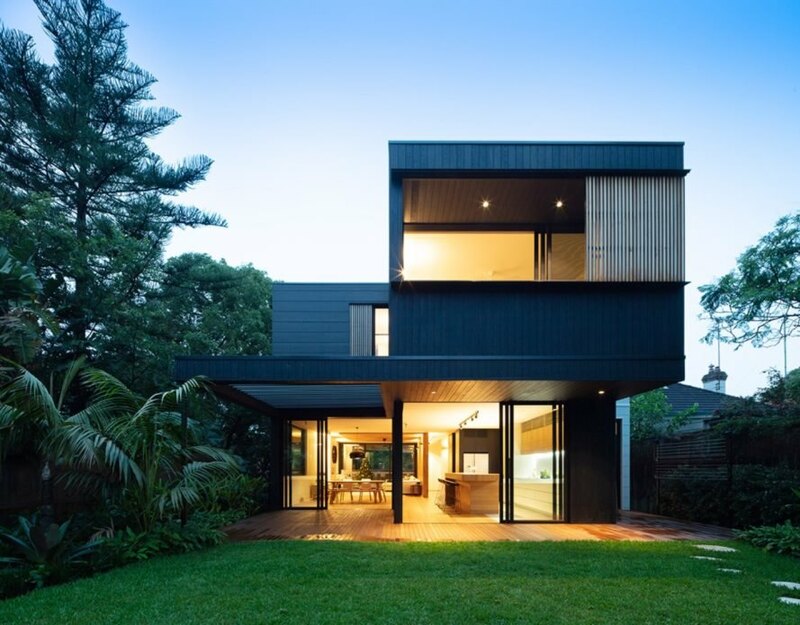 The home was prefabricated at Modscape’s Melbourne factory in 12 weeks and then transported in 10 modules to the site, where the home was completed after an additional six weeks’ time. This prefab home was first designed by Fox Johnston, then refined by Modscape. The house was constructed via prefabrication. Contrasting with the dark exterior, the interiors are filled with natural light. The open-plan living, dining and kitchen area opens directly to the outdoors. Cross ventilation and other passive design features keep the interior comfortable year-round. Indoor-outdoor living is emphasized throughout. Timber battened screens help mitigate solar heat gain. A spacious outdoor patio and yard are ideal for enjoying the environment. The home was constructed in just 12 weeks. Once the pieces were delivered to the site, it took only six weeks to come together. Despite its striking, complex appearance, the home was quick to come together. The house allows the clients to enjoy their surroundings, even if they are indoors.